This is for 24 Peacock Inspired candle holders from Shopatusm. This centerpiece will shimmer and shine with style on your table! 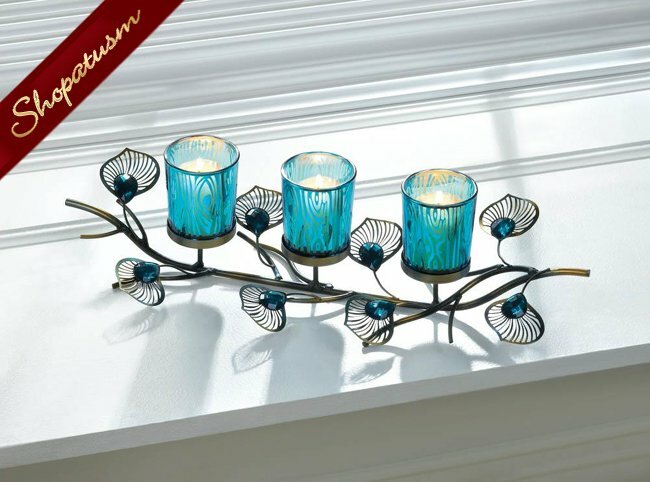 This gorgeous trio of turquoise blue glass candle cups are ready for the candles of your choice. They are surrounded by golden metal peacock plumes and faceted turquoise jewels. This is the perfect candle accessory for your dining table or your mantel. Measurements: 16" x 4.75" x 4" high. Weight: 1.2 pounds.